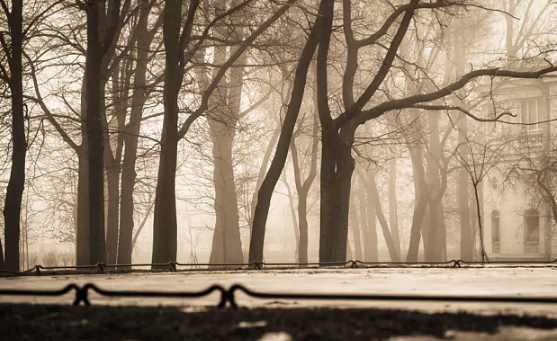 This short story is considered one of the best emerging from the bleak school of Russian realism. It has influenced to greatness leading authors since its creation in the mid-19th century. The plot is simple. It conveys a deeply dark theme of man vs. bureaucracies and it has a twist at the end. In the department of … but it is better not to name the department. There is nothing more irritable than all kinds of departments, regiments, courts of justice and, in a word, every branch of public service. Each separate man nowadays thinks all society insulted in his person. They say that, quite recently, a complaint was received from a justice of the peace, in which he plainly demonstrated that all the imperial institutions were going to the dogs, and that his sacred name was being taken in vain; and in proof he appended to the complaint a huge volume of some romantic composition, in which the justice of the peace appears about once in every ten lines, sometimes in a drunken condition. Therefore, in order to avoid all unpleasantness, it will be better for us to designate the department in question as a certain department. 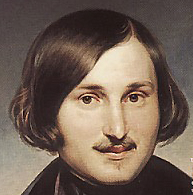 Nikolay Gogol (born March 19, 1809, Sorochintsy, near Poltava, Ukraine, Russian Empire [now in Ukraine]—died February 21 1852, Moscow, Russia). Early 19th century humorist, dramatist, and novelist whose works, written in Russian, significantly influenced the direction of Russian literature. His novel Myortvye dushi (1842; Dead Souls) and his short story “Shinel” (1842; “The Overcoat”) are considered the foundations of the great 19th-century tradition of Russian realism. So, in a certain department serves a certain official—not a very prominent official, it must be allowed—short of stature, somewhat pockmarked, rather red-haired, rather blind, judging from appearances, with a small bald spot on his forehead, with wrinkles on his cheeks, with a complexion of the sort called sanguine. … How could he help it? The Petersburg climate was responsible for that. As for his rank—for with us the rank must be stated first of all—he was what is called a perpetual titular councillor, over which, as is well known, some writers make merry and crack their jokes, as they have the praiseworthy custom of attacking those who cannot bite back. His family name was Bashmachkin. It is evident from the name, that it originated in bashmak (shoe); but when, at what time, and in what manner, is not known. His father and grandfather, and even his brother-in-law, and all the Bashmachkins, always wore boots, and only had new heels two or three times a year. His name was Akakii Akakievich. It may strike the reader as rather singular and far-fetched; but he may feel assured that it was by no means far-fetched, and that the circumstances were such that it would have been impossible to give him any other name; and this was how it came about. In order to please her, they opened the calendar at another place: three more names appeared—Triphilii, Dula and Varakhasii. “This is a judgment,” said the old woman. “What names! I truly never heard the like. Varadat or Varukh might have been borne, but not Triphilii and Varakhasii!” They turned another page—Pavsikakhii and Vakhtisii. “Now I see,” said the old woman, “that it is plainly fate. And if that’s the case, it will be better to name him after his father. His father’s name was Akakii, so let his son’s be also Akakii.” In this manner he became Akakii Akakievich. They christened the child, whereat he wept, and made a grimace, as though he foresaw that he was to be a titular councillor. In this manner did it all come about. We have mentioned it, in order that the reader might see for himself that it happened quite as a case of necessity, and that it was utterly impossible to give him any other name. When and how he entered the department, and who appointed him, no one could remember. However much the directors and chiefs of all kinds were changed, he was always to be seen in the same place, the same attitude, the same occupation—the same official for letters; so that afterwards it was affirmed that he had been born in undress uniform with a bald spot on his head. No respect was shown him in the department. The janitor not only did not rise from his seat when he passed, but never even glanced at him, as if only a fly had flown through the reception-room. His superiors treated him in a coolly despotic manner. Some assistant chief would thrust a paper under his nose without so much as saying, “Copy,” or, “Here’s a nice, interesting matter,” or any thing else agreeable, as is customary in well-bred service. And he took it, looking only at the paper, and not observing who handed it to him, or whether he had the right to do so: he simply took it, and set about copying it. The young officials laughed at and made fun of him, so far as their official wit permitted; recounted there in his presence various stories concocted about him, and about his landlady, an old woman of seventy; they said that she beat him; asked when the wedding was to be; and strewed bits of paper over his head, calling them snow. But Akakii Akakievich answered not a word, as though there had been no one before him. It even had no effect upon his employment: amid all these molestations he never made a single mistake in a letter. But if the joking became utterly intolerable, as when they jogged his hand, and prevented his attending to his work, he would exclaim, “Leave me alone! Why do you insult me?” And there was something strange in the words and the voice in which they were uttered. There was in it a something which moved to pity; so that one young man, lately entered, who, taking pattern by the others, had permitted himself to make sport of him, suddenly stopped short, as though all had undergone a transformation before him, and presented itself in a different aspect. Some unseen force repelled him from the comrades whose acquaintance he had made, on the supposition that they were well-bred and polite men. And long afterwards, in his gayest moments, there came to his mind the little official with the bald forehead, with the heart-rending words, “Leave me alone! Why do you insult me?” And in these penetrating words, other words resounded—“I am thy brother.” And the poor young man covered his face with his hand; and many a time afterwards, in the course of his life, he shuddered at seeing how much inhumanity there is in man, how much savage coarseness is concealed in delicate, refined worldliness and, O God! even in that man whom the world acknowledges as honorable and noble. It would be difficult to find another man who lived so entirely for his duties. It is saying but little to say that he served with zeal: no, he served with love. In that copying, he saw a varied and agreeable world. Enjoyment was written on his face: some letters were favorites with him; and when he encountered them, he became unlike himself; he smiled and winked, and assisted with his lips, so that it seemed as though each letter might be read in his face, as his pen traced it. If his pay had been in proportion to his zeal, he would, perhaps, to his own surprise, have been made even a councillor of state. But he served, as his companions, the wits, put it, like a buckle in a button-hole. Moreover, it is impossible to say that no attention was paid to him. One director being a kindly man, and desirous of rewarding him for his long service, ordered him to be given something more important than mere copying; namely, he was ordered to make a report of an already concluded affair, to another court: the matter consisted simply in changing the heading, and altering a few words from the first to the third person. This caused him so much toil, that he was all in a perspiration, rubbed his forehead, and finally said, “No, give me rather something to copy.” After that they let him copy on forever. Outside this copying, it appeared that nothing existed for him. He thought not at all of his clothes: his undress uniform was not green, but a sort of rusty-meal color. The collar was narrow, low, so that his neck, in spite of the fact that it was not long, seemed inordinately long as it emerged from that collar, like the necks of plaster cats which wag their heads, and are carried about upon the heads of scores of Russian foreigners. And something was always sticking to his uniform—either a piece of hay or some trifle. Moreover, he had a peculiar knack, as he walked in the street, of arriving beneath a window when all sorts of rubbish was being flung out of it: hence he always bore about on his hat melon and watermelon rinds, and other such stuff. Never once in his life did he give heed to what was going on every day in the street; while it is well known that his young brother official, extending the range of his bold glance, gets so that he can see when any one’s trouser-straps drop down upon the opposite sidewalk, which always calls forth a malicious smile upon his face. But Akakii Akakievich, if he looked at anything, saw in all things the clean, even strokes of his written lines; and only when a horse thrust his muzzle, from some unknown quarter, over his shoulder, and sent a whole gust of wind down his neck from his nostrils, did he observe that he was not in the middle of a line, but in the middle of the street. On arriving at home, he sat down at once at the table, supped his cabbage-soup quickly and ate a bit of beef with onions, never noticing their taste, ate it all with flies and anything else which the Lord sent at the moment. On observing that his stomach began to puff out, he rose from the table, took out a little vial with ink and copied papers which he had brought home. If there happened to be none, he took copies for himself, for his own gratification, especially if the paper was noteworthy, not on account of its beautiful style, but of its being addressed to some new or distinguished person. Even at the hour when the gray Petersburg sky had quite disappeared, and all the world of officials had eaten or dined, each as he could, in accordance with the salary he received, and his own fancy; when all were resting from the departmental jar of pens, running to and fro, their own and other people’s indispensable occupations and all the work that an uneasy man makes willingly for himself, rather than what is necessary; when officials hasten to dedicate to pleasure the time that is left to them—one bolder than the rest goes to the theater; another, into the streets, devoting it to the inspection of some bonnets; one wastes his evening in compliments to some pretty girl, the star of a small official circle; one—and this is the most common case of all—goes to his comrades on the fourth or third floor, to two small rooms with an ante-room or kitchen, and some pretensions to fashion, a lamp or some other trifle which has cost many a sacrifice of dinner or excursion—in a word, even at the hour when all officials disperse among the contracted quarters of their friends, to play at whist, as they sip their tea from glasses with a kopek’s worth of sugar, draw smoke through long pipes, relating at times some bits of gossip which a Russian man can never, under any circumstances, refrain from, or even when there is nothing to say, recounting everlasting anecdotes about the commandant whom they had sent to inform that the tail of the horse on the Falconet Monument had been cut off—in a word, even when all strive to divert themselves, Akakii Akakievich yielded to no diversion. No one could ever say that he had seen him at any sort of an evening party. Having written to his heart’s content, he lay down to sleep, smiling at the thought of the coming day—of what God might send to copy on the morrow. Thus flowed on the peaceful life of the man, who, with a salary of four hundred rubles, understood how to be content with his fate; and thus it would have continued to flow on, perhaps, to extreme old age, were there not various ills sown among the path of life for titular councillors as well as for private, actual, court and every other species of councillor, even for those who never give any advice or take any themselves. There exists in Petersburg a powerful foe of all who receive four hundred rubles salary a year, or thereabouts. This foe is no other than our Northern cold, although it is said to be very wholesome. At nine o’clock in the morning, at the very hour when the streets are filled with men bound for the departments, it begins to bestow such powerful and piercing nips on all noses impartially that the poor officials really do not know what to do with them. At the hour when the foreheads of even those who occupy exalted positions ache with the cold, and tears start to their eyes, the poor titular councillors are sometimes unprotected. Their only salvation lies in traversing as quickly as possible, in their thin little overcoats, five or six streets, and then warming their feet well in the porter’s room, and so thawing all their talents and qualifications for official service, which had become frozen on the way. Akakii Akakievich had felt for some time that his back and shoulders suffered with peculiar poignancy, in spite of the fact that he tried to traverse the legal distance with all possible speed. He finally wondered whether the fault did not lie in his overcoat. He examined it thoroughly at home, and discovered that in two places, namely, on the back and shoulders, it had become thin as mosquito-netting: the cloth was worn to such a degree that he could see through it, and the lining had fallen into pieces. You must know that Akakii Akakievich’s overcoat served as an object of ridicule to the officials: they even deprived it of the noble name of overcoat, and called it a kapota. In fact, it was of singular make: its collar diminished year by year, but served to patch its other parts. The patching did not exhibit great skill on the part of the tailor, and turned out, in fact, baggy and ugly. Seeing how the matter stood, Akakii Akakievich decided that it would be necessary to take the overcoat to Petrovich, the tailor, who lived somewhere on the fourth floor up a dark staircase, and who, in spit of his having but one eye, and pock-marks all over his face, busied himself with considerable success in repairing the trousers and coats of officials and others; that is to say, when he was sober, and not nursing some other scheme in his head. It is not necessary to say much about this tailor: but, as it is the custom to have the character of each personage in a novel clearly defined, there is nothing to be done; so here is Petrovich the tailor. At first he was called only Grigorii, and was some gentleman’s serf: he began to call himself Petrovich from the time when he received his free papers, and began to drink heavily on all holidays, at first on the great ones, and then on all church festivals without discrimination, wherever a cross stood in the calendar. On this point he was faithful to ancestral custom; and, quarrelling with his wife, he called her a low female and a German. As we have stumbled upon his wife, it will be necessary to say a word or two about her; but, unfortunately, little is known of her beyond the fact that Petrovich has a wife, who wears a cap and a dress; but she cannot lay claim to beauty, it seems—at least, no one but the soldiers of the guard, as they pulled their mustaches, and uttered some peculiar sound, even looked under her cap when they met her. Ascending the staircase which led to Petrovich—which, to do it justice, was all soaked in water (dishwater), and penetrated with the smell of spirits which affects the eyes, and is an inevitable adjunct to all dark stairways in Petersburg houses—ascending the stairs, Akakii Akakievich pondered how much Petrovich would ask, and mentally resolved not to give more than two rubles. The door was open; for the mistress, in cooking some fish, had raised such a smoke in the kitchen that not even the beetles were visible. Akakii Akakievich passed through the kitchen unperceived, even by the housewife, and at length reached a room where he beheld Petrovich seated on a large, unpainted table, with his legs tucked under him like a Turkish pasha. His feet were bare, after the fashion of tailors as they sit at work; and the first thing which arrested the eye was his thumb, very well known to Akakii Akakievich, with a deformed nail thick and strong as a turtle’s shell. Akakii Akakievich was displeased at arriving at the precise moment when Petrovich was angry: he liked to order something of Petrovich when the latter was a little downhearted, or, as his wife expressed it, “when he had settled himself with brandy, the one-eyed devil!” Under such circumstances, Petrovich generally came down in his price very readily, and came to an understanding, and even bowed and returned thanks. Afterwards, to be sure, his wife came, complaining that her husband was drunk, and so had set the price too low; but, if only a ten-kopek piece were added, then the matter was settled. But now it appeared that Petrovich was in a sober condition, and therefore rough, taciturn, and inclined to demand, Satan only knows what price. “I wish you a good-morning, sir,” said Petrovich, and squinted at Akakii Akakievich’s hands, wishing to see what sort of booty he had brought. “Ah! I … to you, Petrovich, this”—It must be known that Akakii Akakievich expressed himself chiefly by prepositions, adverbs, and by such scraps of phrases as had no meaning whatever. But if the matter was a very difficult one, then he had a habit of never completing his sentences; so that quite frequently, having begun his phrase with the words, “This, in fact, is quite” … there was no more of it, and he forgot himself, thinking that he had already finished it. “What is it?” asked Petrovich, and with his one eye scanned his whole uniform, beginning with the collar down to the cuffs, the back, the tails and button-holes, all of which were very well known to him, because they were his own handiwork. Such is the habit of tailors: it is the first thing they do on meeting one. Akakii Akakievich’s heart sank at these words. “Well, you would have to lay out a hundred and fifty or more,” said Petrovich, and pursed up his lips significantly. He greatly liked powerful effects, liked to stun utterly and suddenly, and then to glance sideways to see what face the stunned person would put on the matter. “A hundred and fifty rubles for an overcoat!” shrieked poor Akakii Akakievich—shrieked perhaps for the first time in his life, for his voice had always been distinguished for its softness. “No, then, it would be a waste of labor and money,” said Petrovich; and Akakii Akakievich went away after these words, utterly discouraged. But Petrovich stood long after his departure, with significantly compressed lips, and not betaking himself to his work, satisfied that he would not be dropped, and an artistic tailor employed. Akakii Akakievich went out into the street as if in a dream. “Such an affair!” he said to himself: “I did not think it had come to” … and then after a pause, he added, “Well, so it is! see what it has come to at last! and I never imagined that it was so!” Then followed a long silence, after which he exclaimed, “Well, so it is! see what already exactly, nothing unexpected that … it would be nothing … what a circumstance!” So saying, instead of going home, he went in exactly the opposite direction without himself suspecting it. On the way, a chimney-sweep brought his dirty side up against him, and blackened his whole shoulder: a whole hatful of rubbish landed on him from the top of a house which was building. He observed it not; and afterwards, when he ran into a sentry, who, having planted his halberd beside him, was shaking some snuff from his box into his horny hand—only then did he recover himself a little, and that because the sentry said, “Why are you thrusting yourself into a man’s very face? Haven’t you the sidewalk?” This caused him to look about him, and turn towards home. At one time he would not work at any price, and now it was quite likely that he had asked a price which it was not worth. Although he knew that Petrovich would undertake to make it for eighty rubles, still, where was he to get the eighty rubles? He might possibly manage half; yes, a half of that might be procured: but where was the other half to come from? But the reader must first be told where the first half came from. Akakii Akakievich had a habit of putting, for every ruble he spent, a groschen into a small box, fastened with lock and key, and with a hole in the top for the reception of money. At the end of each half-year, he counted over the heap of coppers, and changed it into small silver coins. This he continued for a long time; and thus, in the course of some years, the sum proved to amount to over forty rubles. Thus he had one half on hand; but where to get the other half? where to get another forty rubles? Akakii Akakievich thought and thought, and decided that it would be necessary to curtail his ordinary expenses, for the space of one year at least—to dispense with tea in the evening; to burn no candles, and, if there was anything which he must do, to go into his landlady’s room, and work by her light; when he went into the street, he must walk as lightly as possible, and as cautiously, upon the stones and flagging, almost upon tiptoe, in order not to wear out his heels in too short a time; he must give the laundress as little to wash as possible; and, in order not to wear out his clothes, he must take them off as soon as he got home, and wear only his cotton dressing-gown, which had been long and carefully saved. To tell the truth, it was a little hard for him at first to accustom himself to these deprivations; but he got used to them at length, after a fashion, and all went smoothly—he even got used to being hungry in the evening; but he made up for it by treating himself in spirit, bearing ever in mind the thought of his future coat. From that time forth, his existence seemed to become, in some way, fuller, as if he were married, as if some other man lived in him, as if he were not alone, and some charming friend had consented to go along life’s path with him—and the friend was no other than that overcoat, with thick wadding and a strong lining incapable of wearing out. He became more lively, and his character even became firmer, like that of a man who has made up his mind, and set himself a goal. From his face and gait, doubt and indecision—in short, all hesitating and wavering traits—disappeared of themselves. Fire gleamed in his eyes: occasionally, the boldest and most daring ideas flitted through his mind; why not, in fact, have marten fur on the collar? The thought of this nearly made him absent-minded. Once, in copying a letter, he nearly made a mistake, so that he exclaimed almost aloud, “Ugh!” and crossed himself. 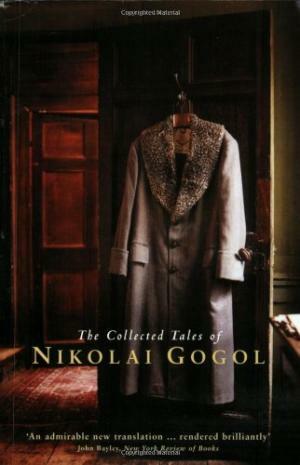 Once in the course of each month, he had a conference with Petrovich on the subject of the coat—where it would be better to buy the cloth, and the color, and the price—and he always returned home satisfied, though troubled, reflecting that the time would come at last when it could all be bought, and then the overcoat could be made. The matter progressed more briskly than he had expected. Far beyond all his hopes, the director appointed neither forty nor forty-five rubles for Akakii Akakievich’s share, but sixty. Did he suspect that Akakii Akakievich needed an overcoat? or did it merely happen so? at all events, twenty extra rubles were by this means provided. This circumstance hastened matters. Only two or three months more of hunger—and Akakii Akakievich had accumulated about eighty rubles. His heart, generally so quiet, began to beat. On the first possible day, he visited the shops in company with Petrovich. They purchased some very good cloth—and reasonably, for they had been considering the matter for six months, and rarely did a month pass without their visiting the shops to inquire prices; and Petrovich said himself, that no better cloth could be had. For lining, they selected a cotton stuff, but so firm and thick, that Petrovich declared it to be better than silk, and even prettier and more glossy. They did not buy the marten fur, because it was dear, in fact; but in its stead, they picked out the very best of cat-skin which could be found in the shop, and which might be taken for marten at a distance. Petrovich worked at the coat two whole weeks, for there was a great deal of quilting: otherwise it would have been done sooner. 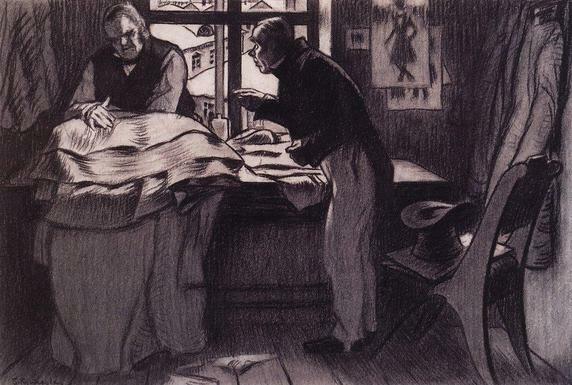 Petrovich charged twelve rubles for his work—it could not possibly be done for less: it was all sewed with silk, in small, double seams; and Petrovich went over each seam afterwards with his own teeth, stamping in various patterns. It was—it is difficult to say precisely on what day, but it was probably the most glorious day in Akakii Akakievich’s life, when Petrovich at length brought home the coat. He brought it in the morning, before the hour when it was necessary to go to the department. Never did a coat arrive so exactly in the nick of time; for the severe cold had set in, and it seemed to threaten increase. Petrovich presented himself with the coat as befits a good tailor. On his countenance was a significant expression, such as Akakii Akakievich had never beheld there. He seemed sensible to the fullest extent that he had done no small deed, and that a gulf had suddenly appeared, separating tailors who only put in linings, and make repairs, from those who make new things. He took the coat out of the large pocket-handkerchief in which he had brought it. (The handkerchief was fresh from the laundress: he now removed it, and put it in his pocket for use.) Taking out the coat, he gazed proudly at it, held it with both hands, and flung it very skilfully over the shoulders of Akakii Akakievich; then he pulled it and fitted it down behind with his hand; then he draped it around Akakii Akakievich without buttoning it. Akakii Akakievich, as a man advanced in life, wished to try the sleeves. Petrovich helped him on with them, and it turned out that the sleeves were satisfactory also. In short, the coat appeared to be perfect, and just in season. Petrovich did not neglect this opportunity to observe that it was only because he lived in a narrow street, and had no signboard, and because he had known Akakii Akakievich so long, that he had made it so cheaply; but, if he had been on the Nevsky Prospect, he would have charged seventy-five rubles for the making alone. Akakii Akakievich did not care to argue this point with Petrovich, and he was afraid of the large sums with which Petrovich was fond of raising the dust. He paid him, thanked him, and set out at once in his new coat for the department. Petrovich followed him, and, pausing in the street, gazed long at the coat in the distance, and went to one side expressly to run through a crooked alley, and emerge again into the street to gaze once more upon the coat from another point, namely, directly in front. Meantime Akakii Akakievich went on with every sense in holiday mood. 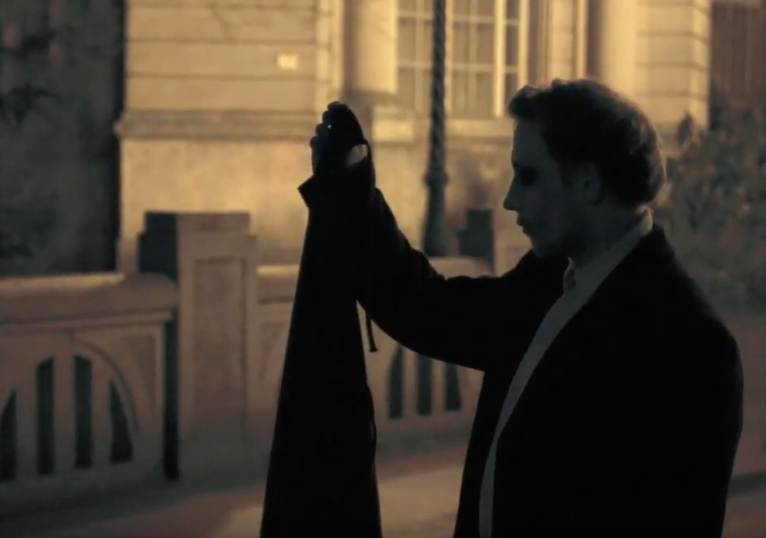 He was conscious every second of the time, that he had a new overcoat on his shoulders; and several times he laughed with internal satisfaction. In fact, there were two advantages—one was its warmth; the other, its beauty. He saw nothing of the road, and suddenly found himself at the department. He threw off his coat in the ante-room, looked it over well, and confided it to the especial care of the janitor. It is impossible to say just how every one in the department knew at once that Akakii Akakievich had a new coat, and that the “mantle” no longer existed. All rushed at the same moment into the ante-room, to inspect Akakii Akakievich’s new coat. They began to congratulate him, and to say pleasant things to him, so that he began at first to smile, and then he grew ashamed. The officials naturally at once offered the assistant chief their congratulations, and accepted the invitation with pleasure. Akakii Akakievich would have declined; but all declared that it was discourteous, that it was simply a sin and a shame, and that he could not possibly refuse. Besides, the idea became pleasant to him when he recollected that he should thereby have a chance to wear his new coat in the evening also. That whole day was truly a most triumphant festival day for Akakii Akakievich. He returned home in the most happy frame of mind, threw off his coat, and hung it carefully on the wall, admiring afresh the cloth and the lining; and then he brought out his old, worn-out coat, for comparison. He looked at it, and laughed, so vast was the difference. And long after dinner he laughed again when the condition of the “mantle” recurred to his mind. He dined gayly, and after dinner wrote nothing, no papers even, but took his ease for a while on the bed, until it got dark. Then he dressed himself leisurely, put on his coat, and stepped out into the street. Where the host lived, unfortunately we cannot say: our memory begins to fail us badly; and everything in St. Petersburg, all the houses and streets, have run together, and become so mixed up in our head, that it is very difficult to produce anything thence in proper form. At all events, this much is certain, that the official lived in the best part of the city; and therefore it must have been anything but near to Akakii Akakievich. Akakii Akakievich was first obliged to traverse a sort of wilderness of deserted, dimly lighted streets; but in proportion as he approached the official’s quarter of the city, the streets became more lively, more populous, and more brilliantly illuminated. Pedestrians began to appear; handsomely dressed ladies were more frequently encountered; the men had otter collars; peasant wagoners, with their grate-like sledges stuck full of gilt nails, became rarer; on the other hand, more and more coachmen in red velvet caps, with lacquered sleighs and bear-skin robes, began to appear; carriages with decorated coach-boxes flew swiftly through the streets, their wheels scrunching the snow. Akakii Akakievich gazed upon all this as upon a novelty. He had not been in the streets during the evening for years. He halted out of curiosity before the lighted window of a shop, to look at a picture representing a handsome woman, who had thrown off her shoe, thereby baring her whole foot in a very pretty way; and behind her the head of a man with side-whiskers and a handsome mustache peeped from the door of another room. Akakii Akakievich shook his head, and laughed, and then went on his way. Why did he laugh? Because he had met with a thing utterly unknown, but for which every one cherishes, nevertheless, some sort of feeling; or else he thought, like many officials, as follows: “Well, those French! What is to be said? If they like anything of that sort, then, in fact, that” … But possibly he did not think that. For it is impossible to enter a man’s mind, and know all that he thinks. At length he reached the house in which the assistant chief lodged. The assistant chief lived in fine style: on the staircase burned a lantern; his apartment was on the second floor. On entering the vestibule, Akakii Akakievich beheld a whole row of overshoes on the floor. Amid them, in the centre of the room, stood a samovar, humming, and emitting clouds of steam. On the walls hung all sorts of coats and cloaks, among which there were even some with beaver collars or velvet facings. Beyond the wall the buzz of conversation was audible, which became clear and loud when the servant came out with a trayful of empty glasses, cream-jugs, and sugar-bowls. It was evident that the officials had arrived long before, and had already finished their first glass of tea. Akakii Akakievich, having hung up his own coat, entered the room; and before him all at once appeared lights, officials, pipes, card-tables; and he was surprised by a sound of rapid conversation rising from all the tables, and the noise of moving chairs. He halted very awkwardly in the middle of the room, wondering, and trying to decide, what he ought to do. But they had seen him: they received him with a shout, and all went out at once into the ante-room, and took another look at his coat. Akakii Akakievich, although somewhat confused, was open-hearted, and could not refrain from rejoicing when he saw how they praised his coat. Then, of course, they all dropped him and his coat, and returned, as was proper, to the tables set out for whist. All this—the noise, talk, and throng of people—was rather wonderful to Akakii Akakievich. He simply did not know where he stood, or where to put his hands, his feet, and his whole body. Finally he sat down by the players, looked at the cards, gazed at the face of one and another, and after a while began to gape, and to feel that it was wearisome—the more so, as the hour was already long past when he usually went to bed. He wanted to take leave of the host; but they would not let him go, saying that he must drink a glass of champagne, in honor of his new garment, without fail. In the course of an hour, supper was served, consisting of vegetable salad, cold veal, pastry, confectioner’s pies, and champagne. They made Akakii Akakievich drink two glasses of champagne, after which he felt that the room grew livelier: still, he could not forget that it was twelve o’clock, and that he should have been at home long ago. In order that the host might not think of some excuse for detaining him, he went out of the room quietly, sought out, in the ante-room, his overcoat, which, to his sorrow, he found lying on the floor, brushed it, picked off every speck, put it on his shoulders, and descended the stairs to the street. In the street all was still bright. Some petty shops, those permanent clubs of servants and all sorts of people, were open: others were shut, but, nevertheless, showed a streak of light the whole length of the door-crack, indicating that they were not yet free of company, and that probably domestics, both male and female, were finishing their stories and conversations, leaving their masters in complete ignorance as to their whereabouts. Akakii Akakievich went on in a happy frame of mind: he even started to run, without knowing why, after some lady, who flew past like a flash of lightning, and whose whole body was endowed with an extraordinary amount of movement. But he stopped short, and went on very quietly as before, wondering whence he had got that gait. Soon there spread before him those deserted streets, which are not cheerful in the daytime, not to mention the evening. Now they were even more dim and lonely: the lanterns began to grow rarer—oil, evidently, had been less liberally supplied; then came wooden houses and fences: not a soul anywhere; only the snow sparkled in the streets, and mournfully darkled the low-roofed cabins with their closed shutters. He approached the place where the street crossed an endless square with barely visible houses on its farther side, and which seemed a fearful desert. Afar, God knows where, a tiny spark glimmered from some sentry-box, which seemed to stand on the edge of the world. Akakii Akakievich’s cheerfulness diminished at this point in a marked degree. He entered the square, not without an involuntary sensation of fear, as though his heart warned him of some evil. He glanced back and on both sides—it was like a sea about him. “No, it is better not to look,” he thought, and went on, closing his eyes; and when he opened them, to see whether he was near the end of the square, he suddenly beheld, standing just before his very nose, some bearded individuals—of just what sort, he could not make out. All grew dark before his eyes, and his breast throbbed. Akakii Akakievich felt them take off his coat, and give him a push with a knee: he fell headlong upon the snow, and felt no more. In a few minutes he recovered consciousness, and rose to his feet; but no one was there. He felt that it was cold in the square, and that his coat was gone: he began to shout, but his voice did not appear to reach to the outskirts of the square. In despair, but without ceasing to shout, he started on a run through the square, straight towards the sentry-box, beside which stood the watchman, leaning on his halberd, and apparently curious to know what devil of a man was running towards him from afar, and shouting. Akakii Akakievich ran up to him, and began in a sobbing voice to shout that he was asleep, and attended to nothing, and did not see when a man was robbed. The watchman replied that he had seen no one; that he had seen two men stop him in the middle of the square, and supposed that they were friends of his; and that, instead of scolding in vain, he had better go to the captain on the morrow, so that the captain might investigate as to who had stolen the coat. Akakii Akakievich ran home in complete disorder: his hair, which grew very thinly upon his temples and the back of his head, was entirely disarranged; his side and breast, and all his trousers, were covered with snow. The old woman, mistress of his lodgings, hearing a terrible knocking, sprang hastily from her bed, and, with a shoe on one foot only, ran to open the door, pressing the sleeve of her chemise to her bosom out of modesty; but when she had opened it, she fell back on beholding Akakii Akakievich in such a state. When he told the matter, she clasped her hands, and said that he must go straight to the superintendent, for the captain would turn up his nose, promise well, and drop the matter there: the very best thing to do, would be to go to the superintendent; that he knew her, because Finnish Anna, her former cook, was now nurse at the superintendent’s; that she often saw him passing the house; and that he was at church every Sunday, praying, but at the same time gazing cheerfully at everybody; and that he must be a good man, judging from all appearances. Having listened to this opinion, Akakii Akakievich betook himself sadly to his chamber; and how he spent the night there, any one can imagine who can put himself in another’s place. Early in the morning, he presented himself at the superintendent’s, but they told him that he was asleep. He went again at ten—and was again informed that he was asleep. He went at eleven o’clock, and they said, “The superintendent is not at home.” At dinner-time, the clerks in the ante-room would not admit him on any terms, and insisted upon knowing his business, and what brought him, and how it had come about—so that at last, for once in his life, Akakii Akakievich felt an inclination to show some spirit, and said curtly that he must see the superintendent in person; that they should not presume to refuse him entrance; that he came from the department of justice, and, when he complained of them, they would see. The clerks dared make no reply to this, and one of them went to call the superintendent. The superintendent listened to the extremely strange story of the theft of the coat. Instead of directing his attention to the principal points of the matter, he began to question Akakii Akakievich. Why did he return so late? Was he in the habit of going, or had he been, to any disorderly house? So that Akakii Akakievich got thoroughly confused, and left him without knowing whether the affair of his overcoat was in proper train, or not. All that day he never went near the court (for the first time in his life). The next day he made his appearance, very pale, and in his old “mantle,” which had become even more shabby. The news of the robbery of the coat touched many; although there were officials present who never omitted an opportunity, even the present, to ridicule Akakii Akakievich. They decided to take up a collection for him on the spot, but it turned out a mere trifle; for the officials had already spent a great deal in subscribing for the director’s portrait, and for some book, at the suggestion of the head of that division, who was a friend of the author: and so the sum was trifling. One, moved by pity, resolved to help Akakii Akakievich with some good advice at least, and told him that he ought not to go to the captain, for although it might happen that the police-captain, wishing to win the approval of his superior officers, might hunt up the coat by some means, still, the coat would remain in the possession of the police if he did not offer legal proof that it belonged to him: the best thing for him would be to apply to a certain prominent personage; that this prominent personage, by entering into relations with the proper persons, could greatly expedite the matter. As there was nothing else to be done, Akakii Akakievich decided to go to the prominent personage. What was the official position of the prominent personage, remains unknown to this day. The reader must know that the prominent personage had but recently become a prominent personage, but up to that time he had been an insignificant person. Moreover, his present position was not considered prominent in comparison with others more prominent. But there is always a circle of people to whom what is insignificant in the eyes of others, is always important enough. Moreover, he strove to increase his importance by many devices; namely, he managed to have the inferior officials meet him on the staircase when he entered upon his service: no one was to presume to come directly to him, but the strictest etiquette must be observed; the “Collegiate Recorder” must announce to the government secretary, the government secretary to the titular councillor, or whatever other man was proper, and the business came before him in this manner. In holy Russia, all is thus contaminated with the love of imitation: each man imitates and copies his superior. They even say that a certain titular councillor, when promoted to the head of some little separate court-room, immediately partitioned off a private room for himself, called it the Audience Chamber, and posted at the door a lackey with red collar and braid, who grasped the handle of the door, and opened to all comers; though the audience chamber would hardly hold an ordinary writing-table. Otherwise he was a very kind-hearted man, good to his comrades, and ready to oblige; but the rank of general threw him completely off his balance. On receiving that rank, he became confused, as it were, lost his way, and never knew what to do. If he chanced to be with his equals, he was still a very nice kind of man—a very good fellow in many respects, and not stupid: but just the moment that he happened to be in the society of people but one rank lower than himself, he was simply incomprehensible; he became silent; and his situation aroused sympathy, the more so, as he felt himself that he might have made an incomparably better use of the time. In his eyes, there was sometimes visible a desire to join some interesting conversation and circle; but he was held back by the thought, Would it not be a very great condescension on his part? Would it not be familiar? and would he not thereby lose his importance? And in consequence of such reflections, he remained ever in the same dumb state, uttering only occasionally a few monosyllabic sounds, and thereby earning the name of the most tiresome of men. To this prominent personage, our Akakii Akakievich presented himself, and that at the most unfavorable time, very inopportune for himself, though opportune for the prominent personage. The prominent personage was in his cabinet, conversing very, very gayly with a recently arrived old acquaintance and companion of his childhood, whom he had not seen for several years. At such a time it was announced to him that a person named Bashmachkin had come. Nevertheless, he ordered that the official should wait, in order to show his friend—a man who had not been in the service for a long time, but had lived at home in the country—how long officials had to wait in his ante-room. At length, having talked himself completely out, and more than that, having had his fill of pauses, and smoked a cigar in a very comfortable arm-chair with reclining back, he suddenly seemed to recollect, and told the secretary, who stood by the door with papers of reports, “Yes, it seems, indeed, that there is an official standing there. Tell him that he may come in.” On perceiving Akakii Akakievich’s modest mien, and his worn undress uniform, he turned abruptly to him, and said, “What do you want?” in a curt, hard voice, which he had practised in his room in private, and before the looking-glass, for a whole week before receiving his present rank. Akakii Akakievich, who already felt betimes the proper amount of fear, became somewhat confused: and as well as he could, as well as his tongue would permit, he explained, with a rather more frequent addition than usual of the word that, that his overcoat was quite new, and had been stolen in the most inhuman manner; that he had applied to him, in order that he might, in some way, by his intermediation, that … he might enter into correspondence with the chief superintendent of police, and find the coat. “What, what, what!” said the important personage. “Where did you get such courage? Where did you get such ideas? What impudence towards their chiefs and superiors has spread among the young generation!” The prominent personage apparently had not observed that Akakii Akakievich was already in the neighborhood of fifty. If he could be called a young man, then it must have been in comparison with some one who was seventy. “Do you know to whom you speak? Do you realize who stands before you? Do you realize it? do you realize it? I ask you!” Then he stamped his foot, and raised his voice to such a pitch that it would have frightened even a different man from Akakii Akakievich. Akakii Akakievich’s senses failed him; he staggered, trembled in every limb, and could not stand; if the porters had not run in to support him, he would have fallen to the floor. They carried him out insensible. But the prominent personage, gratified that the effect should have surpassed his expectations, and quite intoxicated with the thought that his word could even deprive a man of his senses, glanced sideways at his friend in order to see how he looked upon this, and perceived, not without satisfaction, that his friend was in a most undecided frame of mind, and even beginning, on his side, to feel a trifle frightened. Akakii Akakievich could not remember how he descended the stairs, and stepped into the street. He felt neither his hands nor feet. Never in his life had he been so rated by any general, let alone a strange one. He went on through the snow-storm, which was howling through the streets, with his mouth wide open, slipping off the sidewalk: the wind, in Petersburg fashion, flew upon him from all quarters, and through every cross-street. In a twinkling it had blown a quinsy into his throat, and he reached home unable to utter a word: his throat was all swollen, and he lay down on his bed. So powerful is sometimes a good scolding! Did Akakii Akakievich hear these fatal words? and, if he heard them, did they produce any overwhelming effect upon him? Did he lament the bitterness of his life?—We know not, for he continued in a raving, parching condition. Visions incessantly appeared to him, each stranger than the other: now he saw Petrovich, and ordered him to make a coat, with some traps for robbers, who seemed to him to be always under the bed; and he cried, every moment, to the landlady to pull one robber from under his coverlet: then he inquired why his old “mantle” hung before him when he had a new overcoat; then he fancied that he was standing before the general, listening to a thorough setting-down, and saying, “Forgive, your excellency!” but at last he began to curse, uttering the most horrible words, so that his aged landlady crossed herself, never in her life having heard anything of the kind from him—the more so, as those words followed directly after the words your excellency. Later he talked utter nonsense, of which nothing could be understood: all that was evident, was that his incoherent words and thoughts hovered ever about one thing—his coat. At last poor Akakii Akakievich breathed his last. They sealed up neither his room nor his effects, because, in the first place, there were no heirs, and, in the second, there was very little inheritance; namely, a bunch of goose-quills, a quire of white official paper, three pairs of socks, two or three buttons which had burst off his trousers, and the “mantle” already known to the reader. To whom all this fell, God knows. I confess that the person who told this tale took no interest in the matter. “Well, because: he is already dead! he was buried four days ago.” In this manner did they hear of Akakii Akakievich’s death at the department; and the next day a new and much larger official sat in his place, forming his letters by no means upright, but more inclined and slantwise. But who could have imagined that this was not the end of Akakii Akakievich—that he was destined to raise a commotion after death, as if in compensation for his utterly insignificant life? But so it happened, and our poor story unexpectedly gains a fantastic ending. A rumor suddenly spread throughout Petersburg that a dead man had taken to appearing on the Kalinkin Bridge, and far beyond, at night, in the form of an official seeking a stolen coat, and that, under the pretext of its being the stolen coat, he dragged every one’s coat from his shoulders without regard to rank or calling—cat-skin, beaver, wadded, fox, bear, raccoon coats; in a word, every sort of fur and skin which men adopted for their covering. One of the department employés saw the dead man with his own eyes, and immediately recognized in him Akakii Akakievich: nevertheless, this inspired him with such terror, that he started to run with all his might, and therefore could not examine thoroughly, and only saw how the latter threatened him from afar with his finger. Constant complaints poured in from all quarters, that the backs and shoulders, not only of titular but even of court councillors, were entirely exposed to the danger of a cold, on account of the frequent dragging off of their coats. Arrangements were made by the police to catch the corpse, at any cost, alive or dead, and punish him as an example to others, in the most severe manner: and in this they nearly succeeded; for a policeman, on guard in Kirushkin Alley, caught the corpse by the collar on the very scene of his evil deeds, for attempting to pull off the frieze coat of some retired musician who had blown the flute in his day. Having seized him by the collar, he summoned, with a shout, two of his comrades, whom he enjoined to hold him fast, while he himself felt for a moment in his boot, in order to draw thence his snuff-box, to refresh his six times forever frozen nose; but the snuff was of a sort which even a corpse could not endure. The policeman had no sooner succeeded, having closed his right nostril with his finger, in holding half a handful up to the left, than the corpse sneezed so violently that he completely filled the eyes of all three. While they raised their fists to wipe them, the dead man vanished utterly, so that they positively did not know whether they had actually had him in their hands at all. Thereafter the watchmen conceived such a terror of dead men, that they were afraid even to seize the living; and only screamed from a distance, “Hey, there! go your way!” and the dead official began to appear, even beyond the Kalinkin Bridge, causing no little terror to all timid people. But we have totally neglected that certain prominent personage, who may really be considered as the cause of the fantastic turn taken by this true history. First of all, justice compels us to say, that after the departure of poor, thoroughly annihilated Akakii Akakievich, he felt something like remorse. Suffering was unpleasant to him: his heart was accessible to many good impulses, in spite of the fact that his rank very often prevented his showing his true self. As soon as his friend had left his cabinet, he began to think about poor Akakii Akakievich. And from that day forth, poor Akakii Akakievich, who could not bear up under an official reprimand, recurred to his mind almost every day. The thought of the latter troubled him to such an extent, that a week later he even resolved to send an official to him, to learn whether he really could assist him; and when it was reported to him that Akakii Akakievich had died suddenly of fever, he was startled, listened to the reproaches of his conscience, and was out of sorts for the whole day. Wishing to divert his mind in some way, and forget the disagreeable impression, he set out that evening for one of his friends’ houses, where he found quite a large party assembled; and, what was better, nearly every one was of the same rank, so that he need not feel in the least constrained. This had a marvellous effect upon his mental state. He expanded, made himself agreeable in conversation, charming: in short, he passed a delightful evening. After supper he drank a couple of glasses of champagne—not a bad recipe for cheerfulness, as every one knows. The champagne inclined him to various out-of-the-way adventures; and, in particular, he determined not to go home, but to go to see a certain well-known lady, Karolina Ivanovna, a lady, it appears, of German extraction, with whom he felt on a very friendly footing. It must be mentioned that the prominent personage was no longer a young man, but a good husband, and respected father of a family. Two sons, one of whom was already in the service, and a good-looking, sixteen-year-old daughter, with a rather retroussé but pretty little nose, came every morning to kiss his hand, and say, “Bonjour, papa.” His wife, a still fresh and good-looking woman, first gave him her hand to kiss, and then, reversing the procedure, kissed his. But the prominent personage, though perfectly satisfied in his domestic relations, considered it stylish to have a friend in another quarter of the city. This friend was hardly prettier or younger than his wife; but there are such puzzles in the world, and it is not our place to judge them. So the important personage descended the stairs, stepped into his sleigh, and said to the coachman, “To Karolina Ivanovan’s,” and, wrapping himself luxuriously in his warm coat, found himself in that delightful position than which a Russian can conceive nothing better, which is, when you think of nothing yourself, yet the thoughts creep into your mind of their own accord, each more agreeable than the other, giving you no trouble to drive them away, or seek them. Fully satisfied, he slightly recalled all the gay points of the evening just passed, and all the mots which had made the small circle laugh. Many of them he repeated in a low voice, and found them quite as funny as before; and therefore it is not surprising that he should laugh heartily at them. 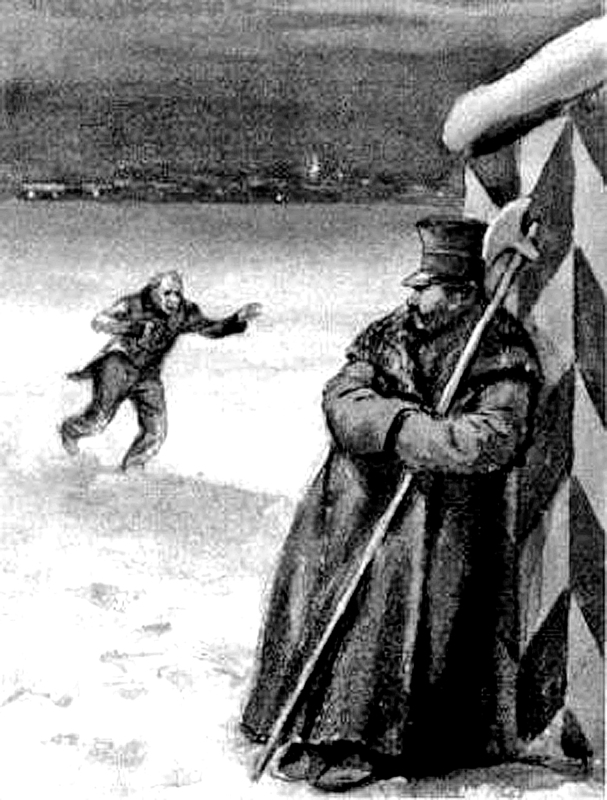 Occasionally, however, he was hindered by gusts of wind, which, coming suddenly, God knows whence or why, cut his face, flinging in it lumps of snow, filling out his coat-collar like a sail, or suddenly blowing it over his head with supernatural force, and thus causing him constant trouble to disentangle himself. Suddenly the important personage felt some one clutch him very firmly by the collar. “Ah, here you are at last! I have you, that … by the collar! I need your coat. You took no trouble about mine, but reprimanded me; now give up your own.” The pallid prominent personage almost died. Brave as he was in the office and in the presence of inferiors generally, and although, at the sight of his manly form and appearance, every one said, “Ugh! how much character he has!” yet at this crisis, he, like many possessed of an heroic exterior, experienced such terror, that, not without cause, he began to fear an attack of illness. He flung his coat hastily from his shoulders, and shouted to his coachman in an unnatural voice, “Home, at full speed!” The coachman, hearing the tone which is generally employed at critical moments, and even accompanied by something much more tangible, drew his head down between his shoulders in case of an emergency, flourished his knout, and flew on like an arrow. In a little more than six minutes the prominent personage was at the entrance of his own house. Pale, thoroughly scared, and coatless, he went home instead of to Karolina Ivanovna’s, got to his chamber after some fashion, and passed the night in the direst distress; so that the next morning over their tea, his daughter said plainly, “You are very pale to-day, papa.” But papa remained silent, and said not a word to any one of what had happened to him, where he had been, or where he had intended to go. This occurrence made a deep impression upon him. He even began to say less frequently to the under-officials, “How dare you? do you realize who stands before you?” and, if he did utter the words, it was after first having learned the bearings of the matter. But the most noteworthy point was, that from that day the apparition of the dead official quite ceased to be seen; evidently the general’s overcoat just fitted his shoulders; at all events, no more instances of his dragging coats from people’s shoulders were heard of. But many active and apprehensive persons could by no means reassure themselves, and asserted that the dead official still showed himself in distant parts of the city. And, in fact, one watchman in Kolomna saw with his own eyes the apparition come from behind a house; but being rather weak of body—so much so, that once upon a time an ordinary full-grown pig running out of a private house knocked him off his legs, to the great amusement of the surrounding public coachmen, from whom he demanded a groschen apiece for snuff, as damages—being weak, he dared not arrest him, but followed him in the dark, until, at length, the apparition looked round, paused, and inquired, “What do you want?” and showed such a fist as you never see on living men. The watchman said, “It’s of no consequence,” and turned back instantly. But the apparition was much too tall, wore huge mustaches, and, directing its steps apparently towards the Obukhoff Bridge, disappeared in the darkness of the night.